Going into 2008 I knew that my birding time would be reduced from prior years, but I was able to make the most of my time in the field. The intensity of school varied greatly from month to month; some months were completely devoid of birding while others allowed for several days in the field. 2008 began with great excitement as we were in the midst of a fantastic winter for irruptive passerines. Flocks of Pine Grosbeaks and Common Redpolls were already in place in northern CT when the year began. On January 3rd, Don Morgan allowed me to check out his backyard redpoll flock in Coventry where he had previously reported a few pale redpolls. Close examination of the flock on a brutally cold day revealed the presence of a Hoary Redpoll...the first documented in the state since the year I was born (1983.....yes, you're old)! Later that month, Greg Hanisek & co turned up a fine Western Tanager in the campground at Hammonasset State Park, which was another state bird for me. School really turned up the heat on us for the rest of the winter, so my birding was restricted to the occasional chase. The next such bird was a first-spring male Bullock's Oriole at the residence of Ingrid & Tom Schaefer of Canaan, who were gracious enough to open up their yard to birders. In mid-April shorebird migration kicked into high gear and Frank Mantlik found a nice young male Ruff at Grace Salmon Park in Westport. The Ruff is the second bird from the left. Definitely one of the highlights of the year came on May 22 while I was chasing a Eurasian Collared-Dove at Hammo. 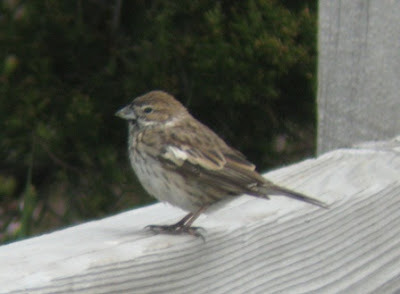 No luck with the dove, but Dori Sosensky and I stumbled upon this female Lark Bunting, the third state record. 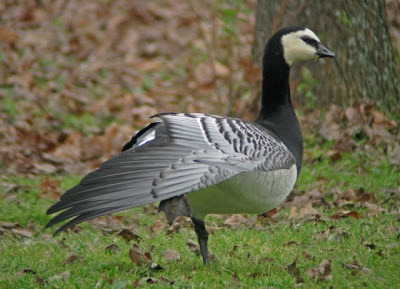 Most records of this species in the northeast are of autumn birds, so this spring sighting was especially surprising. The autumn migration was relatively uneventful as far as rarities go. I got into the field here and there, but clinical rotations began on Sept 15th so birding was really only possible on certain weekends. 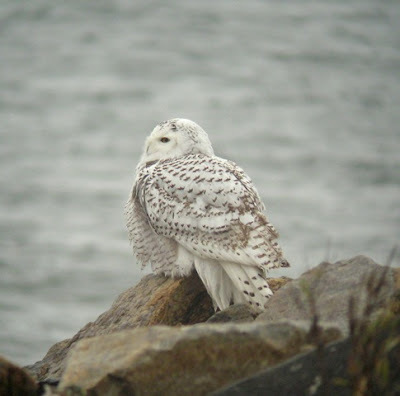 November was highlighted by a statewide flight of Snowy Owls and a cooperative Barnacle Goose in Wallingford. 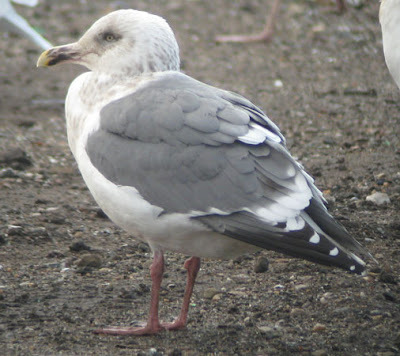 My personal Bird of the Year came on the day after Thanksgiving in the form of the state's first Slaty-backed Gull at the Windsor-Bloomfield Landfill. Finally I reached my research time, which allowed me to be on my own schedule for much of December. This allowed for 4 more trips to the landfill before the end of the year. The gulling was fantastic. Not one but two Thayer's Gulls put in appearances in December. In addition, multiple Glaucous Gulls, a handful of Lesser Black-backs, and a slew of Iceland Gulls were in attendance. 2008 was much more successful than I had anticipated going into the year. I just added up my CT year list and arrived at a total of 266 species...not terrible. I had several fairly easy misses, particularly species that pass through the state when school was at its most demanding. For example, I just got my first (and only) Fox Sparrow of the year on December 28th! So what will 2009 bring? I can think of a few birds for the wish list! A Happy and Healthy New Year to everyone.